My obsession with mint chocolate everything started a long time ago with the little Andes mints we used to get after eating at a restaurant. I can’t remember which one it was, but I can’t forget the way those mints tasted. It was perfection to my very young palette. I also thought it meant the restaurant was very fancy. I know…it didn’t take much to impress me. Looking back, I know the restaurants we went to weren’t really fancy, but it didn’t matter. It was the extra little touch that stuck with me, and began my love for all things mint chocolate. A trip to Baskin Robbins meant a scoop of mint chocolate chip on a sugar cone (or Daquiri Ice flavor…anyone else remember that? ), buying a pint of Ben and Jerry’s meant Mint Chocolate Cookie, and the last minute purchase at the checkout stand was a York Peppermint Patty. It’s just one of those flavor combinations that works for me. Fast forward to now, and I still love mint and chocolate together. Sometimes simple combinations really are the way to go. In the summer, I make mint chocolate chip ice cream, which I will share with you as soon as I fire up the ice cream maker for the year, and I order peppermint mochas at Starbucks. In my undying devotion to mint and chocolate, I found a cookie that featured my favorite green wrapped mints and had to try it immediately. It also included a pretty nifty way to frost the cookies (fun!). I made them, ate one as soon as it had cooled, and realized it tasted like my favorite little mints…on steroids! These cookies won’t come wrapped in the shiny green foil paper, but you can still have them at the end of the meal and because you made them, it will definitely qualify as fancy. Combine butter, sugar, and water in a medium saucepan and cook over low heat. Stir occasionally, until butter is melted. Add semisweet chocolate chips. Stir until chips are melted. Transfer to bowl of a stand mixer and let cool for 10-15 minutes. Whisk together flour, baking soda, and salt in a medium bowl. Add eggs and vanilla to cooled chocolate mixture and mix on medium high until eggs are combined and everything looks smooth. Add in mint chocolate chips, cover and refrigerate for at least 1 hour. Preheat oven to 350. Line a baking sheet with parchment paper. Scoop dough by rounded tablespoons and roll into ball. Place on prepared baking sheet, 2 inches apart. Bake until just set, about 7-9 minutes. Remove from oven and immediately place 1 mint on top of each cookie. Let stand until softened, then use a small offset spatula or a butter knife to spread the melted chocolate. Transfer to racks to cool. Repeat with remaining cookie dough and mints. 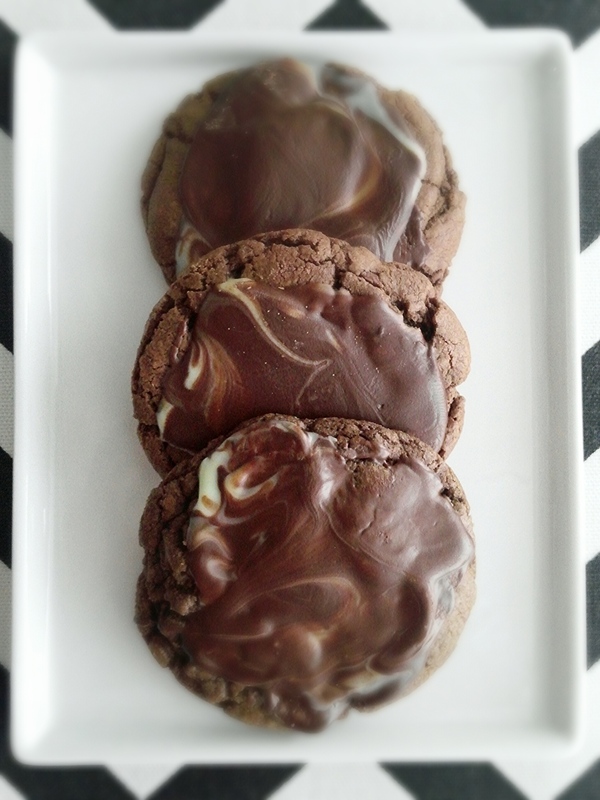 The cookies will be chewy and soft and the minty chocolate topping gives them a little snap when you bite into them. These keep really well in an air tight container for several days. I enjoy mint and chocolate, too. That inspired me to make mini mint chocolate pies. People didn’t know what to make of them at first, but they really enjoyed them. I look forward to more mint chocolate adventures! Thanks for commenting, Carl! Mint chocolate pies sound really delicious! I think mint and chocolate are a classic combination. So delicious! These are exactly what I need right now! Because of the snowy weather, I have been marooned in the house and can’t get to the grocery store, but you best believe I am going as soon as possible to get all the delicious ingredients to make these. What a delight! I hope you are able to get out soon! Let me know if you try these!